Tranquil Oceanfront Escape near Pier Park with Amazing Views at First Class Aqua! 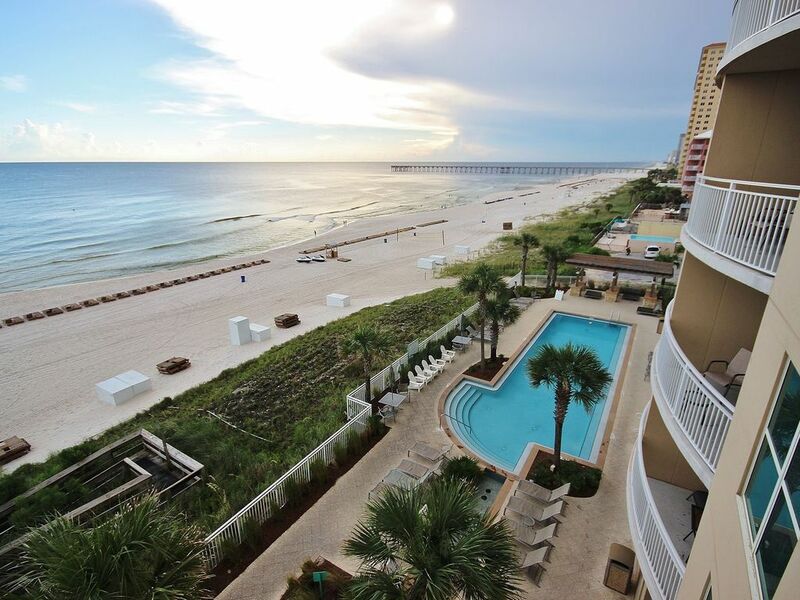 Experience the breathtaking beauty of Panama City Beach in this exquisite, upscale vacation gem. From the moment you open the door, you will realize you are walking into your dream vacation in this professionally decorated elegant condo with tasteful tropical touches. The floor to ceiling windows will beckon you out to your own private balcony. Soak up the sunshine, feel the ocean breeze, beat to the rhyme of the waves and drink in the wonder of your little piece of paradise. This amazing vacation home-away-from-home is both exquisite and functional. The family room, along with the incredible views of the gulf, features stylish & comfortable seating, 42" flat screen TV and dining room set. The sofa has a queen size pullout bed to add additional sleeping capacity. The fully equipped kitchen also boast beautiful views of the beach, allowing you to prepare dinner with this stunning backdrop. It is a testimony to form and function with its granite countertops and stainless steel appliances. The master bedroom is furnished with a king size bed, flat screen TV, and an adjoining master bath with granite countertops, dual sinks, soaker tub and a glass shower. The 2nd bedroom features a queen size bed and flat screen TV. The 2nd bath has a shower/tub combination. There is also a set of bunk beds in the unit, bringing the sleeping occupancy to 8 (including sleeper sofa). Additional amenities include a full size washer & dryer in the unit, cable, free Wi-Fi, and free long distance in the US and Canada. This getaway is ideally located in the Aqua Beachside Resort and right on the sugary white sand of the Panhandle. The complex offers fantastic amenities in a lush tropical setting. Living up to its name, Aqua offers two heated pools, a hot tub, fountains and water gardens. There is also a poolside café, spa and great kid's program (Kid Haven at the Aqua). Within walking distance from Aqua is Pier Park with outstanding restaurants and fabulous shopping. Paradise is calling. Reserve your place in the sun. Raised in central Florida with fathers working at the Kennedy Space Center, we both have a lifetime of fond memories of beach days, beach escapes, beach getaways, and fun filled family beach vacations. Our love of the ocean spans decades as does our romance. High school sweethearts (married for 29 years and counting) and fellow UF graduates, Jeff and Gina have four children. Jordan attends USFSP; while Josh, Jake and Jared go to FSU. (Yes, you read that right. We have 4 in college ~ now there’s some motivation to work.) Jeff has owned an Allstate Insurance Agency since 1990, achieving the highest company award of Top in Country. He also did consulting for 4 years with both Allstate Corporate and individual agencies countrywide; streamlining processes, increasing production, incorporating inventive marketing, maximizing potential revenue, and stressing customer service. Soon after having their fourth child (4 in 4 years), Gina “retired” from her actuarial position to assist Jeff and raise their lively bunch. With a recent house full of teenagers, Gina likewise knows a thing or two about particular “customers”. Pooling very different skill sets but very common passions, we make perfect partners. We are truly blessed, loving what we do and loving doing it together! We have built our home on faith, family, and fun; and strive to build this company on the same. Built 2007 Floor 4 1283 s.f. Wonderful stay, walking distance to restaurants and shops. Would love to come back. We loved staying in 405. It's a very classy unit with elegant furnishings, updated appliances and comfortable beds. We normally stay in a 3-bedroom, so I worried about feeling cramped in a smaller unit. But even though 405 is shotgun style, it feels spacious because of the four doors/windows leading out to the balcony. I prefer a lower floor, so the view was just high enough for me. And the unit is only a few doors from the elevator nearest the east pool. The dining table was large enough for other family members to join us for card games and we also hosted a seafood potluck night with plenty of room for people to sit. We really enjoyed our vacation this year and hope to return to 405. The place was clean and in the perfect place . Furnished very nice and great location. Aqua is best place to stay for my family. This unit was very nice. Had a couple issue I hope was addressed after we left . Would stay again in this unit . $500 ‘down payment’ required at time of booking reservation for stays less than 28 nights; $1000 or 25% of rental fee for 28+ nights (whichever is less). Remaining balance payment schedule explained in reservation confirmation. Prices are subject to change any time prior to date of booking reservation.